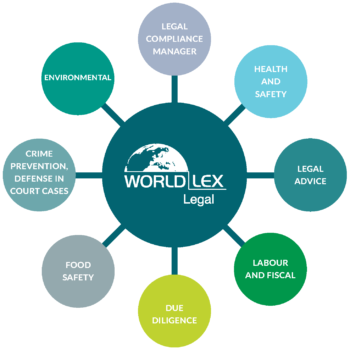 WORLDLEX advises and helps the management of legal obligations with the assurance of a correct management and compliance with different countries regulations where your company may be developing works, activities or developing services. Worldlex advises its clients with the objective of assuring the knowledge of their legal obligations in the countries where they develop their activities. Customization of the service that your company requires. An assigned advisor supervises the customization by avoiding non applicable information. Consultants and partners with wide experience. More than 20 years of experience with large corporations from different sectors. Expiration and maturity of obligations and actions Schedule. Visualization of a Schedule to know and plan the management of obligations and actions. Comparative reports of facilites. Elaboration of comparative reports on the compliance of different facilites, allowing a better planning. Integration of all the obligations a world level. Integration of the information by unifying criteria for different facilites and countries. WORLDLEX has an adapted mobile and tablet versions that allow to access the information in a friendly and easy way, and the on site evaluation of legal compliance. You may attach photography evidence right from your mobile phone or tablet, being stored in your platform and being accesible by any other device or computer with an internet connection.